I recently needed some major hunks of meat for an article I'm working on about how easy it is to grill said hunks for a crowd. I could have called and ordered them from New Seasons, or called around trying to find what I needed, but since time was short I decided to head out to Gartner's Meats on NE Killingsworth, sure that they'd be able to fill the order. From the outside this place looks extremely unimpressive, but the parking lot full of manly "rigs" hints at the delights to be found within. And once you step inside, the fifty-foot-long case filled with every cut of meat from pretty much any farm-raised animal you can name tells you that these guys are serious about their protein. 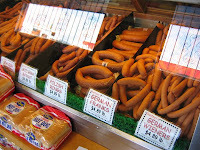 They also have all sorts of cured products from ham and bacon to fresh sausages, as well as German-style smoked meats that come from recipes that founder Jack Gartner's father Hans, trained as a master sausage maker, brought over with him from Germany. Refreshingly old-fashioned and simple, this is a meat market our grandparents would recognize, with the folks behind the counter offering advice about cooking techniques and discussing the latest box scores. 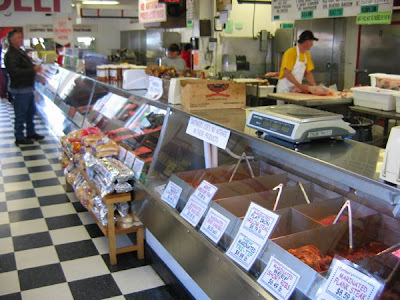 With great prices and a selection that beats any other butcher shop in town hands-down, it's worth a trip the next time you have a meat craving. Details: Gartner's Meats, 7450 NE Killingsworth. Phone 503-252-7801. There are good things and bad things about freelancing. The bad things are mostly about money, or the inconsistency thereof, and having to drum up new business. And if you don't do the latter, the former gets even scarcer. The good things have to do with setting your own schedule and choosing the work you want to do and (mostly) how you want to do it. Another difficulty is not having a place to meet clients for meetings. An impressive conference room always seems more professional than a kitchen table. So I'll often meet people at a quiet coffee shop or café. One of those in the neighborhood is Random Order on NE Alberta. 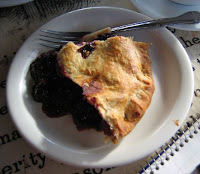 Their coffee and food are really good, but it's their pies that make me drool. All handmade on the premises, they do the expected apple, berry and cream pies, but then they'll throw in some unique combinations just to mix it up a bit, like the rhubarb cardamom beauty above. They've recently added spirits and later hours to their lineup, so you can stop in after an evening out for a little cool-down period before heading home. Details: Random Order Coffeehouse, 1800 NE Alberta. Phone 503-331-1420. Everyone's heard of pairing wines with cheeses. But here in the vortex of Beervana you can learn about pairing your favorite beer with an artisan cheese product. 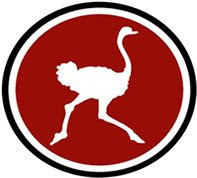 All you have to do is call Foster & Dobbs and reserve your seat for an informative evening with Chris Hodge of Columbia Distributing, who will present a survey of beer styles and ideal cheesy companions for your delectation. 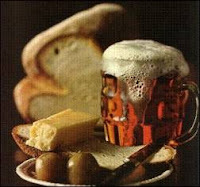 Details: Beer and Cheese Pairings with Chris Hodge. June 18, 7:15 pm; $20, reservations only. Foster & Dobbs Authentic Foods, 2518 NE 15th Ave. Phone 503-284-1157. Monique Dupre is brilliant. Not only has she figured out how to feed her family on a budget, she's done it organically and sustainably. Meaning she's eliminated the need to go to the grocery store so often, simplified her cupboards, and purified her home by eliminating plastics and chemical-based products. She started Sustainable Living on a Budget to teach you how to do the same, and she's giving a class at Kookoolan Farms in June. Check it out! Details: Sustainable Living on a Budget with Monique Dupre. June 20, 7 pm; $35 per person. Register on her website. 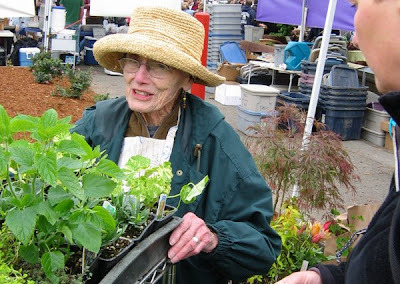 Imagine a summer evening strolling through one of the best nurseries in the area, sipping a glass of wine or a HUB microbrew, every once in awhile coming across a table of noshes from the Oregon Culinary Institute, then watching a demonstration of container gardening. Not to mention it all benefits Growing Gardens, an organization that's fighting hunger by helping low income households build raised bed gardens. Details: An Evening in the Garden: A benefit for Growing Gardens. Sat., June 21, 6-9 pm; tickets $15 at the door with gift bags to first 100. Farmington Gardens, 21815 SW Farmington Rd., Beaverton. 503-649-4568. 'Tis the season for garden tours, and I'm finding endless opportunities to truly turn green with envy virtually every weekend this summer. 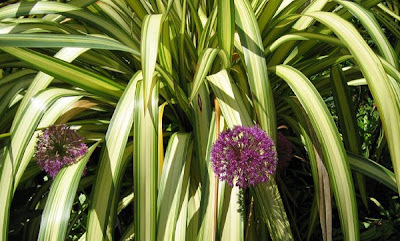 From the Hardy Plant Society of Oregon, that holds open gardens for its members to tour each others' gardens, to the Garden Conservancy, which sponsors regional garden tours, to tours by groups that take an interest in one particular plant, there's no end to your choices. 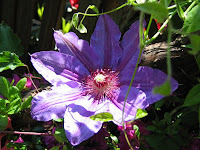 This last weekend I went on the Inviting Vines tour, which visited the home gardens of people who collect clematis, the flowering vines that you see draping over fences and trellises this time of year. Whether you say "cluh-MATT-us" or "CLEM-uh-tuss" or couldn't tell one if you saw it, these tours often feature private gardens that are never open to the public and also give you a chance to ask questions of the homeowner about specific plants. The highlight of this one, for me, was a chance to see the private garden of Lucy Hardiman, local plant goddess and author. I've walked by her home in the Buckman neighborhood many times and peered through the foliage at what looked like a stunningly designed personal space. But having been raised not to impose, I've resisted the urge to jump the fence and conduct my own considered exploration. So entering this space with its owners' blessing was like walking through the gates of Valhalla for a garden novice. Inviting and personal without pretension or preciousness, it felt homey yet impressive and would have been perfectly appropriate for a fancy dress affair or a six-year-old's birthday. And for those of us who want to follow her example but need a little help in sorting out the "good" plants from ones that will croak if the temperature varies more than ten degrees or those that will run amuck in their beds while we sleep in ours, she was handing out copies of Great Plant Picks, a list of 600 of the best plants for Northwest gardens. Luckily they've also posted the list on the website, so everyone can benefit! This time of year is all about sweet young things, and the crunchier the better. Think rhubarb, raab, fiddleheads, baby romaine lettuces and now green garlic. Later on, things will take a sweeter turn with berries, favas, peas and squash, but right now it's all about the snap of freshness. Amber Ferguson of Creative Growers in Noti says she likes the green garlic raw for its delicate, mild flavor. 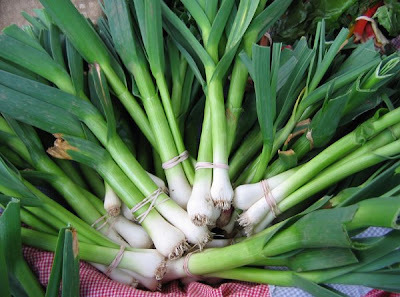 But for those less adventurous, she recommends braising them as you would leeks, chopping them into a stir fry or grilling them like spring onions and finishing with a little olive oil and lemon juice. Hi. 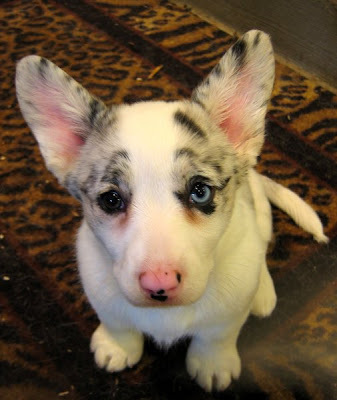 My name is Geisha and I can hear so much better now that my ears have popped up! The weather is finally back to what we expect spring in Oregon to feel like. It's coolish at times, with light, almost mist-like precipitation interspersed with warm, 70-degree days. And these pre-summer temperatures provide an opportunity to get the last of the winter's braising and simmering out of the way before barbecue season hits in earnest. I was going through the dried goods on the pantry shelf yesterday and ran across a bag of dried purgatorio beans from Anthony and Carol Boutard's Ayers Creek Farm. We also had a few slices of uncooked bacon left from Sunday's breakfast, so it seemed that an Italian bean dish would be in order. 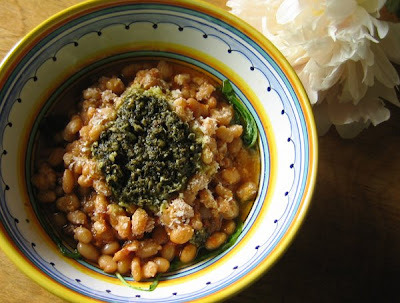 Anthony describes the purgatorio as a "very small, thin-skinned white bean originating from Gradoli (Viterbo), Italy," and I can add that its creamy, lush texture and almost sweet flavor is fabulous when combined with smoky bacon and tomato. Throw in a little arugula from the market and the final batch of pesto from last fall and we called it dinner. Fry bacon in large Dutch oven. When rendered of fat, add chopped onion and garlic and sauté till translucent. Add rest of stew ingredients and bring to a strong simmer. Turn down heat and simmer till beans are tender (at least 1 1/2 hrs.). Add stock or water if it seems too dry, but the end result should have a stew-y rather than a soupy quality. To serve, put a handful of the arugula in the bottom of the bowl. Put a ladle-full of the stew on top, then add a tablespoon or so of pesto. 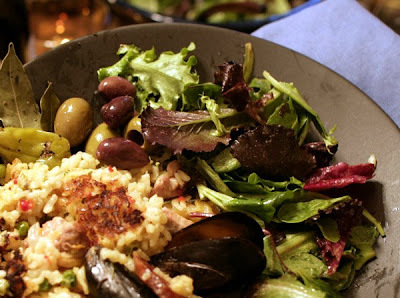 Sprinkle with parmesan and serve with a slice of crusty bread and a glass of red wine alongside. I frequently find myself having really good food in a restaurant I haven't been to for years and thinking, "We need to come here more often." Though, like everyone else, we're trying to cut back on those outside expenses, once in awhile there are friends to meet or people in from out of town or we just need to get out and try something different. Case in point: A small group of women, who have been meeting since our kids were in middle school together, wanted to have dinner. Since they're also all terrific cooks, the food needed to be good but not expensive. Fortunately for us, there is a plethora of places on the east side (where we all live) that meets this criteria. After tossing out a few names, we decided to go to The Farm, a little spot I'd been to and liked a couple of years ago on one of those "I don't feel like cooking" nights. Located in a tiny remodeled Victorian just off busy East Burnside, the four of us got a table in what had been a parlour and ordered drinks from their nicely chosen cocktail list. As appetizers we chose roasted garlic (photo, top) and a baked brie with roasted hazelnuts and honey, a recipe popularized by the long-defunct William's on Twelfth. 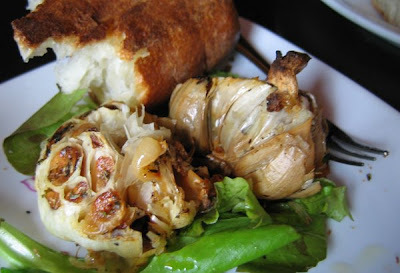 Both were incredible, the roasted garlic perfectly caramelized and tender, the little cloves popping from their wrappers like little buttery fish, and the brie oozing and luscious, begging to be spread on the attendant crispy baguette slices. Goat cheese on baby greens. Entrées for the table tended toward the green, with three of us ordering (respectively), the seafood salad mounded with lots of fresh scallops, crab and shrimp; a pear-arugula salad with Rogue Creamery's amazing Oregonzola and sprinkled with toasted hazelnuts; and then breaded goat cheese rounds fried and set atop baby greens with a caper vinaigrette. Sounds mouth-watering, right? Well, they were, indeed, not only lovely but the kitchen didn't skimp on the featured ingredients. 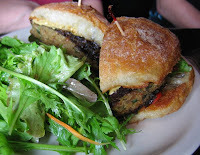 The house burger, a veggie version, was also nicely done and surprisingly juicy and meaty. It was served on a rustic bun and came with caramelized onions and roasted red peppers to round out the smoky, savory quality of the sandwich. We also had a couple of desserts to finish, a cheesecake and a molten chocolate concoction topped with homemade maple ice cream, which were good but not, alas, inspired. The bill for the evening was very reasonable considering what we'd ordered, and I swear that this time I won't wait so long to return. 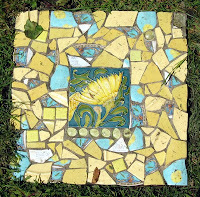 Details: The Farm Cafe, 10 SE 7th Ave. Phone 503-736-3276. From big, ochre-colored and crinkly to tiny, black and pointed, this is the time of year to get to your local farmers' market and get yourself some mushrooms fresh from the forest. 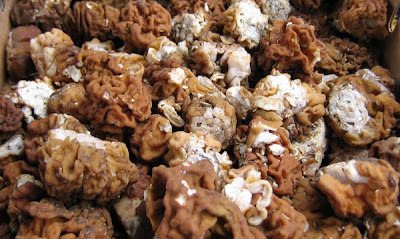 Pictured above are gyromitra gigas (or gyromitra montana in the Western US), commonly called Calf Brains or Snow Morels. They're great sautéed in wine as an appetizer or served over pasta with some spring arugula and a sprinkle of aleppo peppers. Think earthy and rich and you're there. I found these at the Peak Forest Fruit stand at the Hollywood Farmers' Market. 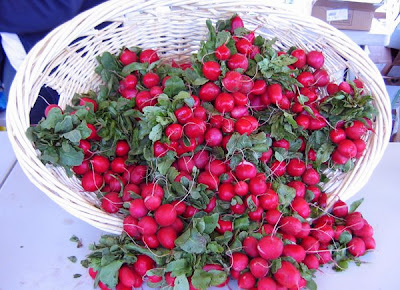 This week's Market Watch column does some celebrity-spotting at the Hollywood Farmers' Market. And we're not talking Katie and Tom or that unfortunate young woman with the bad make-up and drug problem. It's strictly healthy and fun, with the season's freshest faces in the produce department strutting their stuff. Details: Hollywood Farmers' Market. Sat., 8 am-1 pm. On NE Hancock between 44th and 45th Ave.
Photo: Hazel Laughlin working the herb section at River Rock Nursery. Happy hours are aptly named, aren't they? It's the end of the work day, you need a little something to take the edge off and the drinks and/or food are just as good and much cheaper than at dinner. I like to use them for a quick date with Dave after work, or for meeting a friend before going home to make dinner. The other night was just such an occasion, and I met a friend at Tabla on a warm spring evening. Both of us had family commitments later in the evening, but the five o'clock start time would get us home before the troops started grumbling. 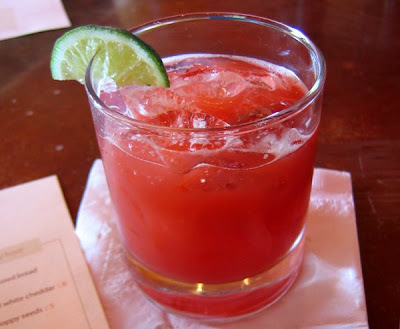 We got started with their happy hour drink special, a raspberry margarita, its fresh fruitiness cooling us off from a hectic day. 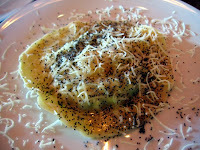 Raviolo with egg and poppy seeds. Lastly, we strayed off the happy hour menu to split an entree of duck confit, my friend's can't-pass-up passion, and I'm glad we scratched her itch. This leg with its perfectly crispy skin around fall-off-the-bone tender meat was one of the best I've had and would be well worth going back for on its own. Details: Happy hour at Tabla. Tues.-Sat., 5-6:30 pm. Tabla, 200 NE 28th Ave. Phone 503-238-3777. After months of gestation, the blessed event took place on an appropriately blustery spring day in the Willamette Valley. The father, farmer Steve Voorhees, was rushing around taking care of last-minute details, but none of the community members attending the birth could tell it was his first time. Read about the entire event here. If you love cheese and want to know more about the processes involved in making it, then you must make plans to attend The Nitty Gritty of Cheesemaking with Mateo Kehler of Vermont's Jasper Hill Farm. He'll focus on the technical aspects of this artisanal process, and from the last class he did at Foster & Dobbs, it'll not only be jam-packed with information but also inspirational for those who love good food made the right way. Details: The Nitty Gritty of Cheesemaking with Mateo Kehler. Tues., May 20, 7:15 pm; $20, reservations only. Foster & Dobbs Authentic Foods, 2518 NE 15th Ave. Phone 503-284-1157. There's a buzz happening around bees lately, and not just due to the recent news about massive die-offs of domestic species. Find out why these creatures are so important to our regional fruit crop and seed production and visit a working farm where they play an important part. It's happening at Ayers Creek Farm and our own correspondent Anthony Boutard will discuss managing bees in the working landscape of a commercial farm. Also on hand will be Dan Hiscoe of Springhill Honeyworks and Matthew Shepherd of the Xerces Society. Don't miss it! 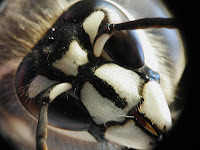 Details: Foundations of Agriculture: Bees and Pollination. 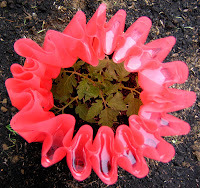 Sat., May 31st., 3-5 pm; $5, members of Slow Food Portland; $10, non-members. At Ayers Creek Farm, Gaston. Directions provided upon registration. Register via e-mail. 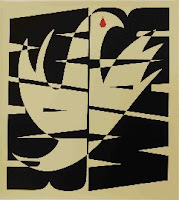 "Peace" is the name of a print show and doves are the visual them that runs through the work at the Guestroom Gallery. It kicks off with a reception for artist Peter Moore on May 16th and continues through the end of June. Moore was known most recently as president of Adidas America, but his graphic work goes back to his days as a designer and creative director at some of Portland's most prestigious advertising firms. 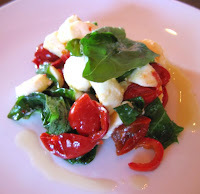 No sooner do I write a post about a good restaurant I found in (gasp!) the burbs than I find myself in deepest Beaverton to get Walker's hips x-rayed (it's some kind of show dog thing). The appointment isn't till two o'clock and, since it's around noon, his breeder and I meet at a little dim sum place I read about in last year's Diner section of the Oregonian. On busy Murray Boulevard across from the Nike campus, China Town Restaurant is nearly invisible to drivers whizzing by. But if you know it's there, you'll step inside its anonymous storefront and into some of the best dim sum I've had in the area. It's not the buzzing whirl of ladies pushing carts that you'll find at Fong Chong downtown, but the quality and freshness are definitely better here. The pork shumai (top photo, lower right) are hot and juicy, and you can really taste the shrimp, ginger and sesame oil mixed with the pork that are the signature of this dish. 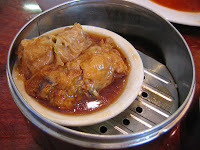 The tofu stuffed with vegetables are luscious and have a lovely, lightly sweet sauce, and the shrimp har gow are similarly bursting with juicy flavor. 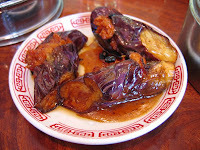 I love the eggplant I've had at other places, and China Town's are terrific with a slice of pork giving the eggplant a hefty bite. As with Peter and his Original Thai BBQ, I wish this place was closer. 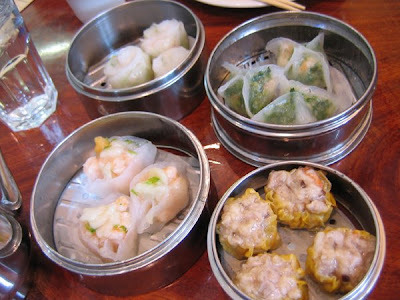 But I'll definitely be making the trek to China Town again when I get a hankering for some great dim sum. Details: China Town Restaurant, 14125 SW Walker Rd., Beaverton. Phone 503-641-4153. 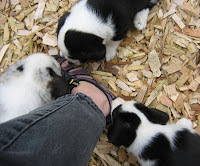 In answer to many requests, yes, I've seen the puppies and, yes, at six weeks they haven't become any less cute, darn them! 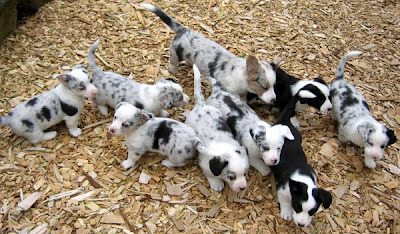 The eight have been joined by Bunny (center, top), who is nine weeks old, and seven more who are about two weeks old and still in that blind, wormy stage, though no less sweet. And here, my friends, is evidence that these harmless-looking, fuzzy mounds of cuteness are, in fact, evil entities bent on destruction. They swarm on any living organism and, with their needle-sharp teeth, attempt to render it into a bloody pulp. Believe me, since they're still nursing I don't envy their mother! Since we've been all about eggs lately, I've started making quiches again. Remember quiche? That 70s standard at all of the chichi bistros that was ordered with a crisp glass of cheap Italian pinot grigio? Most were none-too-imaginative and usually featured broccoli or spinach and mushrooms with some kind of mild cheese thrown in. Then it started getting fancier, adding pesto or sundried tomatoes or chevre. Then the whole thing kind of faded away, like layered hair and leisure suits, with the advent of the 80s. But lately I've found it to be a quick, easy answer to the something-besides-pasta dinner dilemma that doesn't require a trip to the store. And with my friend Antonia's five-minute processor crust, it's a no-brainer. For crust: Blend flour and salt in processor. Add margarine and pulse until the mixture resembles coarse meal. Add water and pulse until the dough starts to come together in the bowl. Remove, wrap in plastic wrap and refrigerate 1 hour. 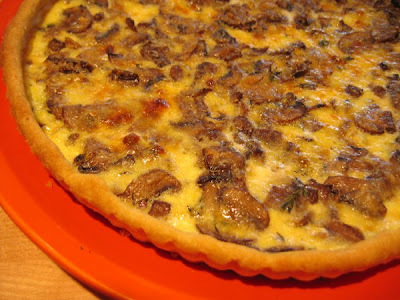 For filling: While dough chills, slice mushrooms and shallots and grate cheese. Melt butter in skillet and add shallots. Saute till translucent, then add mushrooms and saute till golden, about 10 minutes. Mix in herbs and cool. Preheat oven to 375 degrees. Roll out dough and place in non-stick tart pan with removable bottom, allowing 1/2" overlap. Fold rim down with 1/8" of dough remaining above rim. Line crust with foil and bake 20 min. or until lightly golden. Remove foil. Sprinkle cheese in crust. Cover with mushrooms. Whisk cream, yolks, eggs in bowl and pour over ingredients in crust. Sprinkle with parmesan. Bake until filling is set and top is golden, about 30 min. Serve immediately or cool on rack. Blanched broccoli florets, spinach, fried bacon, etc., can be added before baking as well. Mushrooms can be sauteed in 2 Tbsp. cognac or sherry for a more sophisticated flavor, cooking till all liquid is absorbed, then proceeding as directed. Finding good food when you're out of your geographical comfort zone can be a problem. It's not so bad in Beaverton, since there are several very good Asian places and one heckuva fine Mexican spot right downtown. But go east or south and it gets problematic if you want more than drive-up window fare. Though if you're out 205 in the vicinity of the Kaiser hospital on Sunnyside Road, there's a decent little Thai place tucked into the corner of a strip mall that you'd never find on your own. Called Original Thai BBQ, it looks like your typical Asian cafe with specials on a white board up front and tables placed in neat rows. But order their salad rolls with peanut sauce as a starter and the the whole experience starts to take on a much more interesting cast. Owner Peter Chuen will undoubtedly be taking your order and bringing out your food, since he never seems to leave the place, and his smiling visage and personal attention makes every trip a treat. Those salad rolls are packed with a nice assortment of veggies with a strip of tofu down the middle, and the peanut sauce is not the glunky stuff served in too many places. Instead it's a nutty, piquant and entirely slurpable (Leo, this means you!) sauce that accents without overwhelming the cool crunchiness of the rolls. 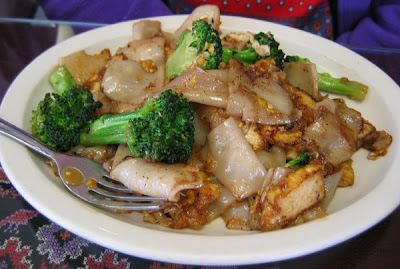 This attention to sauces comes through in the other dishes, too, including the pad see ew (photo, top) which all too often consists of rubbery noodles drowned in a sickly sweet sauce. Here the noodles are soft and pliant, and the sauce is slightly sweet with a deep woodsy resonance that hits the comfort spot square on the head. The sauce on the deep-fried red snapper was equally vivid, with the vegetables crunchy yet tender. The seafood soup was a great find, as well, with a rich herbal broth, thick noodles and extremely fresh and well-prepared seafood scattered throughout the bowl. It's hard to find fault with food this attentively made in a location this unusual. I just wish it was closer to home! Details: Original Thai BBQ, 9895 SE Sunnyside Rd., Suite A, Clackamas, across from Kaiser Sunnyside Hospital. Phone 503-654-4670. It's almost scary how good some folks are at sussing out exactly what will lure people in for a visit. All a woodworking supply shop has to do is mention the word "planes" and Dave is scheming to be the first in line when the doors open. For me it's open gardens at places that aren't normally open to the public. Combine that with wine tasting and food and the hook is set and you can reel me in. Exactly that deadly mix is being offered by four nurseries the weekend of May 17th and 18th. Rare Plant Research, a nursery specializing in hard-to-find tropicals and succulents, will have plants and pots for sale as well as container demonstrations and tours of the almost-completed house modeled after a Spanish Romanesque church in Catalonia, Spain. And King's Raven Winery and A Simple Elegance Catering will offering wine tasting plus lunch and wine for purchase. 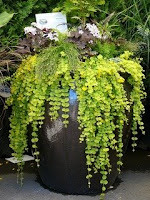 As if that weren't enough, three other nurseries down the road will also be open, including Amber Hill Nursery, featuring rare maples and other trees, Pebble Stone Nursery with their hanging baskets and herbs and Nicole Preciado Nursery specializing in trees and grasses. So if you're not hopelessly hooked by that, then you're better at resisting temptation than I am. Hope to see you there! Details: Open nurseries and plant sales at Rare Plant Research, Amber Hill Nursery, Pebble Stone Nursery and Nicole Preciado Nursery. 11 am-4 pm; free. Start at Rare Plant Research, 11900 S Criteser Rd., Oregon City. 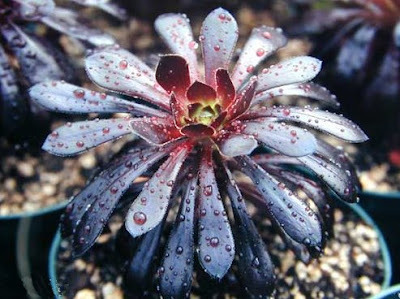 Photo courtesy of Rare Plant Research. One thing I love about farmers' markets is the opportunity for discovery they provide. At every stand I'm peering at this or poking at that, pointing at some vegetable I'm not familiar with and asking about it. 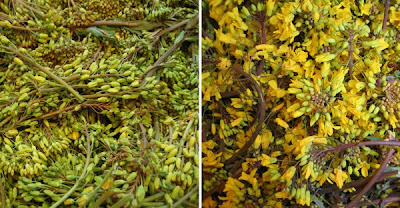 In today's Market Watch column I wrote that I visited the People's Farmers' Market in SE Portland and came across big tubs of odd green and yellow flowering stalks at the Osmogaia stand. After ascertaining from its single-monikered owner, Curly, that these were collard and kale tops (left and right, respectively), I bought some of each and brought them home to experiment with. They have a flavor reminiscent of green beans or fresh asparagus and have a satisfying crunch, as well as a very unique visual texture. Now, having had them in mixed green salads and thrown into stir-fries as well as chopped and sautéed on pastas, I'm going to be looking for these intriguing greens again. Who knew? I've often thought of salad as something to fill that spot in a menu that calls for something green, as in "protein, starch, green vegetable." It's perfect for a dinner party, since it takes almost no prep other than tearing up leaves in a bowl, drizzling a bit of olive oil and vinegar and sprinkling some salt. Done. Take any tightly lidded container (I often use a leftover [clean] salsa container), put all the ingredients into it, put on the lid and shake like the dickens over the sink, in case, as once happened, the lid wasn't as tight as I thought and I ended up dressing the kitchen instead of the salad. Read more recipes in The Basics series: 20 Minute Tomato Sauce, Chile Sauce, Caesar Salad and Strata. There's nothing like a little competition to get you inspired, is there? It happens to Dave whenever the neighbor next door gets out and mows his lawn, making ours look like it just got out of bed after a night of hard drinking. I'm susceptible to the green meanies when it comes to the garden, and this year was no exception. One morning a couple of weekends ago we casually looked out the back door (not snooping, not at all!) and there were the neighbors, sneaking around putting in their tomatoes. GAAA! So, of course, we had to run to the nursery this last weekend. Now ours are comfortably ensconced in their Wall-O-Water jackets, basking in their little red greenhouses and, hopefully, growing like weeds. We decided on just five this year, since last year's bed got a little crowded by harvest time. There are Sungold and Sugar Lump cherry tomatoes, a red Siletz, a Green Zebra and our perennial fave, the Cherokee Purple. We'll be planting lettuce and arugula around the bases while the baby bok choy grows in the second bed. 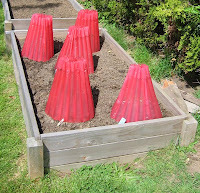 Oh, and you can still download the plan for Dave's raised bed here. I'll keep you posted on how the competition goes! Speaking of columnist and master of edible landscaping Vern Nelson, Sasha Kaplan of And She Cooks informs me that he is also quite the patissier. The man that Sasha claims "puts Martha to shame" will be offering a couple of classes in her home kitchen on baking fruit pies. So if you've always wanted to learn this most delicious (and tricky) of skills, or would just like to improve your own techniques, this might be just the ticket. 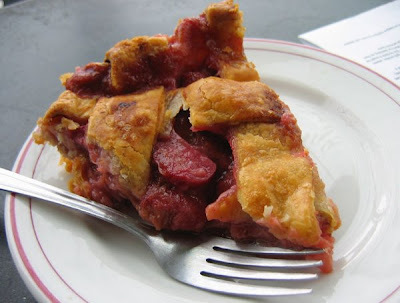 Details: Fruit Pies with Vern Nelson. Summer class on July 27th, Fall class on Oct. 25. 1-4 pm; $75 per person, class size limited to eight. E-mail for reservations. Portland is no longer just a fair-weather biking community. You can't go even a block around here without seeing folks biking to the store and to work, towing their dogs and their kids at all times of the day and night. 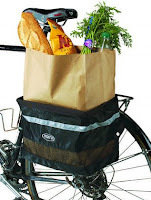 And People's Farmers' Market is planning to thank everyone who rides their bicycle by having a Bike to the Market Day that will provide free workshops on bike maintenance, free tune-ups and repairs and free cycle-powered deliveries in the neighborhood. Plus, get this, free bicycle-powered smoothies! So suit up and get over there for this people-powered celebration. Details: Bike to the Market Day at People's Farmers' Market. Wed., May 14, 2-7 pm; free. People's Farmers' Market, 3029 S.E. 21st Ave., one block N of Powell Blvd. Phone 503-674-2642. Growing up on cheddar and monterey jack, not to mention a two-week binge on Velveeta when I was in sixth grade, I was, shall we say, underexposed to the larger world of cheese. When I tasted my first chevre with its salty tartness and dry-yet-creamy texture...mon Dieu! It was a revelation. 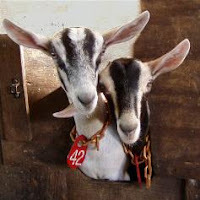 Sellwood cheesemongers Curds & Whey will be celebrating our goaty friends and the deliciousness they give us with a class titled Chevre from Around the World on May 24th. Class size is limited, so call to reserve your spot soon. Details: Chevre from Around the World. May 24th, 7 pm; $25 per person, call to reserve. Curds & Whey, 8036 SE 13th in Sellwood. Phone 503-231-2877.